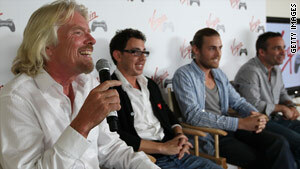 Richard Branson, left, and his partners expect to make money by charging a 12 percent fee on every gaming tournament. Los Angeles, California (CNN) -- "Video games are bigger than ever. ... There's never been a better time to get back in," British billionaire Sir Richard Branson said at the E3 trade show Tuesday in announcing his new venture, Virgin Gaming. An online tournament gaming service, Virgin Gaming lets joystick enthusiasts play popular titles like "Halo 3" and "Madden NFL 10" for cash and prizes on multiplayer services such as PlayStation Network and Xbox Live. More than $1 million in prize money will be given away in the next year, courtesy of the firm, a joint venture between Branson and Canadian startup WorldGaming.com. "The video game market is extremely competitive and overcrowded, but we see a big opportunity," Branson told Game Industry TV, explaining his decision to enter the skill-based gaming business rather than publish software for PC, console or mobile platforms. It's a curious turn, given that his Virgin Interactive, a game publishing label active from 1981-98 before it was purchased by Electronic Arts, was one of the interactive entertainment industry's pioneers. Though he's responsible for acclaimed titles like "Command & Conquer" and "Disney's Aladdin," Branson believes there's no need for history to repeat itself. "The Virgin brand stands for something exciting and different," explained the flamboyant tycoon, whose empire includes an airline and a music label. "That's what we wanted to do here." Branson and his partners, WorldGaming.com founders Bill Levy and Zachary Zeldin, expect to make money by charging a 12 percent fee on every online gaming tournament. Revenue may also come courtesy of corporate sponsors. Players can win big cash payouts or exclusive giveaways by competing in genres such as sports ("NCAA Football 10," "Fight Night Round 4"), driving ("ModNation Racers") and fighting or music (titles to be announced later). But it's unclear just how many gamers will plunk down their hard-earned cash for a shot at storming the online leaderboards, despite matching systems that help pair rivals against contenders of equal skill levels. Many startups have tried this kind of thing unsuccessfully. Services like WorldWinner.com, King.com and BringIt.com offer similar draws. Also, due to federal regulations on Internet gambling, skill-based wagering on games is legal in only 39 states. Still, Branson and his associates clearly believe that the time is right to dip their toes in the virtual water and that they can bring something extra to the table. "Imagine being able to win a weekend on Branson's island," Levy said. If Branson and gaming fans have their way, all that may take is some well-timed button mashing.